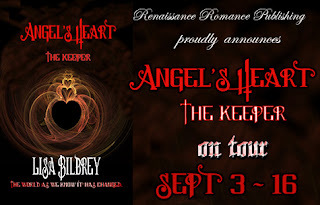 We are very excited about this tour, Angel's Heart by Lisa Bilbrey tour started yesterday and today we wanted to post a great post by Lisa here on the blog. 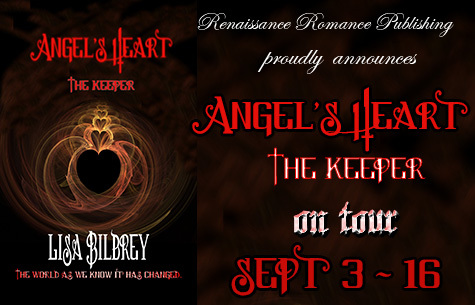 Plus at the bottom is a giveaway you can enter for a chance to win a signed paperback copy of Angel's Heart. Enjoy! With the recent release of Angel’s Heart: The Keeper, I’ve spent a lot of time reflecting how much my life has changed over the last year. There was a time when I believed that I’d never see my books being published. Yet, in the last year, I’ve released three books with a fourth on its way in a few weeks. Sometimes, I have to pinch myself to prove that I’m not dreaming and that in the matter of roughly eight months, I’ve managed to make my dreams come true. Often, I’ve been asked what advice I would give authors who are looking to publish their books. Every time, I tell them the same thing: Keep Writing. It sounds simple, but as anyone who writes everyday can tell you that it’s anything but easy. Our characters often have us dealing with emotions that we never knew we had, and begging for them to just listen to us. They don’t, and eventually, we have to learn to allow them to tell the story that they want being told. So remember when you feel like giving up, to keep going because the moment you see your words on paper, or on the cover, is the moment you know that regardless if you sell a million copies, you’ve become a published author. The winner will be notified by email. If you are the winner you must get back to me within 48 hours of me contacting you. There will be only 1 winner chosen for this giveaway!